BERLIN/WASHINGTON (Reuters) -- Volkswagen Group is struggling to agree with U.S. authorities on a fix for vehicles capable of cheating emissions tests, a VW source said, showing how relations between the two sides remain strained four months after the scandal came to light. VW will hold further talks with the Californian Air Resources Board this week and with the U.S. Environmental Protection Authority (EPA) next week, and still hoped to reach a solution by a mid-January deadline, the source said on Tuesday. But finding a fix was proving more difficult than expected, in part because this involved producing new components which then required testing, said the person, who declined to be named as the talks are confidential. The difficulties highlight the lack of progress VW has made in winning back the confidence of U.S. regulators and drivers almost four months after it admitted to cheating diesel emissions tests and promised to turn over a new leaf. On Monday, the U.S. Justice Department said it was suing Europe's biggest carmaker for allegedly violating environmental law. The move threw VW's U.S. problems back into focus after it seemed to be recovering ground in Europe. VW announced last month it had agreed simple fixes for 8.5 million affected vehicles in Europe, and sharply lowered the number of cars affected by a separate understatement of carbon dioxide emissions. "The announcement serves as a reminder/reality check of VW's still unresolved emissions issues," Goldman Sachs analysts said of the lawsuit. VW CEO Matthias Mueller is expected to meet EPA representatives and politicians in Washington next week after visiting the Detroit auto show, the VW source said, on what will be Mueller's first trip to the U.S. since the scandal broke in September. VW declined to comment on the progress of talks with the EPA, on whose behalf the U.S. Justice Department filed the lawsuit, or on Mueller's plans. The lawsuit in effect claims up to $48 billion in damages. According to a Reuters review of the U.S. complaint, VW could in theory face fines of as much as $37,500 per vehicle for each of two violations of the law; up to $3,750 per "defeat device"; and another $37,500 for each day of violation. U.S. lawsuits are typically settled at a fraction of the theoretical maximum. Goldman has estimated the likely costs at 500 million euros ($534 million). A senior U.S. Justice Department official said the judge was not expected to rule that every car should be charged for all four counts, but said the department had set the bar high, knowing it would come down. Another senior departmental official said a settlement would likely be "in the billions," without elaborating. Both officials declined to be named. The Justice Department said in its complaint it was seeking "appropriate steps" from VW to make nearly 600,000 vehicles compliant with U.S. emissions rules. "Car manufacturers that fail to properly certify their cars and that defeat emission control systems breach the public trust, endanger public health and disadvantage competitors," said Assistant Attorney General John C. Cruden for the Justice Department's Environment and Natural Resources Division. 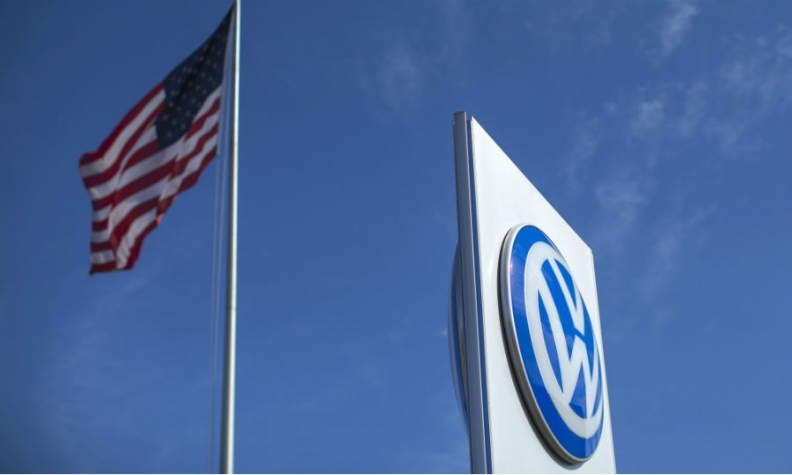 The deputy parliamentary leader for German Chancellor Angela Merkel's conservatives, Michael Fuchs, said that the hard line taken by U.S. authorities against Volkswagen could give U.S. automakers a boost at the expense of their German rivals. "Due to the massive claims against VW that are now out there, I'm starting to suspect that the American authorities are running the risk of pursuing an aggressive industrial policy that favors the U.S. automobile industry to the detriment of our German automobile industry," Fuchs told Reuters. German politicians expressed concern that a hefty U.S. fine could hit jobs. VW employs around 270,000 people in Germany. "The news from the United States is worrying to those who are concerned about securing jobs in the German automotive industry," said Hubertus Heil, deputy head of the Social Democrats (SPD) in the German lower house of parliament. The SPD is part of Merkel's governing coalition. Heil said he still hoped "dramatic consequences" could be avoided by clearing up the scandal swiftly and comprehensively. He added VW's workers should not be made to bear the responsibility for the misconduct of those who carried out the emissions test cheating. Germany has largely rallied around VW since the scandal was uncovered in the U.S. to try to limit the damage to a company that employs some 270,000 people in Germany. But Kerstin Andreae, deputy head of the opposition Green Party in parliament, which has criticized the German coalition government's handling of the scandal, said the U.S. government's actions were to be expected. "It is in nobody's interests that VW is crushed by this but there can't be a legal vacuum for companies, even if they are firms which are of great significance to the economy like VW," she told Reuters, adding she also feared an impact on jobs. In contrast to a crackdown in the U.S. against VW, German politicians and regulators have handled the company too cautiously, critics say. German regulators have approved an inexpensive and simple fix for the majority of the 8.5 million affected vehicles sold in Europe and VW's top executives have not faced interrogation from lawmakers in Germany. Editor's note: An earlier version of this story contained an incorrect damage estimate for the U.S. lawsuit. The suit could theoretically pursue $48 billion in damages, according to Reuters' corrected version of this story.